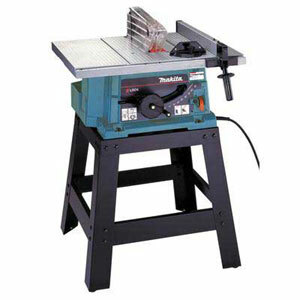 The Makita contractor table saw. I really like this table saw. It's small yet powerful, light yet solid. Downside is the cross cut slide, the channel could be a bit deeper and better fitting. Granted the table top is made of a very strong plastic, that's no reason to have that much slop in the cross slide. Also if you tilt the blade, be careful putting the cover back on and give it a test spin by hand before flipping the switch. When the blade rubs the cover ( especially with a nice carbide blade ) it made a very load noise as it reminds you of your mistake. The double action power switch is also nice to prevent accidentally turning it on. Works very nice to turn it off. Wish however it had the disable keys that is on so many table saws so kids can't accidentally play with it.